Messy but fun. That's what director Zack Snyder's much discussed DC Comics superhero team-up, Justice League, mostly is. Re-written and finished by The Avengers filmmaker Joss Whedon after Snyder was forced to leave the film due to personal tragedy, the Batman v. Superman: Dawn of Justice sequel largely aims to apologize for that film's grim, overlong, self-indulgent tone the way it tried to fix the consequences of Man of Steel before that. Ben Affleck's Batman does a complete 180° turn as a much more hopeful, upbeat hero in awe of Henry Cavill's Superman instead of trying to kill him. Cavill really gets to crack a smile and have fun as a resurrected Man of Steel. However, Gal Gadot as Wonder Woman is clearly still the MVP with an undeniably heroic and forceful performance. No one is having more fun than Jason Momoa as a sort bro version of Aquaman, although he seems completely superfluous and unnecessary (not unlike Hawkeye or Black Widow) as very little takes place anywhere near water. Ezra Miller is the delightfully brash comic relief marvelling in everything and quipping one-liners at every turn. He offers the young Spider-Man role as the over eager newcomer still grappling with his powers and saving the world. Ray Fisher is somewhat charismatically theatrical but is hampered by his mechanical CGI costume and need to deliver so much exposition. The supporting cast is largely set aside but still valued as they lift our heroes and their motivations. 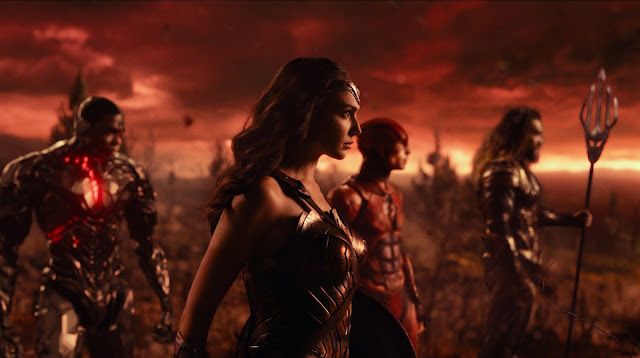 Amy Adams, Jeremy Irons, Diane Lane, and Connie Nielsen return to give aid to Superman, Batman, and Wonder Woman while newcomers J.K. Simmons and Billy Crudup have brief supporting turns. Much has and will be said of Ciarán Hinds' villain Steppenwolf, another other-worldly villain, and his simple plot the League must prevent. He's a weirdly clunky CGI antagonist that is frankly no worse than most subpar Marvel villains but at least he never aims to be more than a plot device to unite our heroes. He's so silly and more dynamic than Doomsday. Chris Terrio and Whedon's brisk script, likely cut and pasted together to be as loose as possible, sets up the threat, puts the team together, reintroduces Superman, and gets to those incomprehensible battles quickly. Game of Thrones cinematographer Fabian Wagner isn't nearly as visual with a dark and red/orange hued palette of CGI action while veteran composer Danny Elfman's light score teases past musical cues throughout. 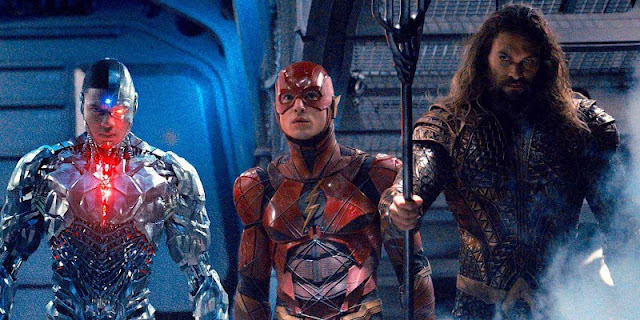 Justice League is a lighthearted mishmash of the DC Universe in mostly entertaining ways. It has the unfortunate task of living up to such a recent string of more inventive takes on superhero mythology. However, unlike other DC films, everyone seems to be genuinely having fun and things move so quickly, it's hard to notice how messy everything really is. What it gets right and what is ultimately the key to Marvel Studios' success, despite disappointments of its own, is the characters. They are all mostly fun and at least appealing enough.